Blurb: Snarling teeth, glowing eyes. Someone--something--is after her. The man who haunts her dreams enters her reality, claiming she's transforming into a changeling--not quite immortal but no longer human. Battle lines are drawn and blood spills as the two fight not only for her life, but for mankind's as well. 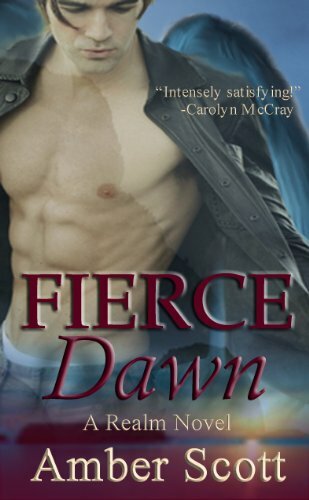 Review: Fierce Dawn is three hundred and fifty six pages of sheer awesome! There are times when I have to gush over a book and this is one of those instances. Amber Scott's paranormal world with its separate realms filled with vampires, angels and changelings, along with their varying abilities, captivated me. I was saddened when the story came to an end. Luckily though, this is the first in a new series. I'll admit I was slightly confused in the beginning until my mind wrapped around the characters and their lingo and all of the worldbuilding the author was creating. When everything clicked, I became absolutely hooked into Sadie's life: the one world filled with strange dreams and her increasing fear of becoming mentally ill like her mother; the other a paranormal realm of dangerous and alluring beings. Sadie was a sympathetic young woman with a growing strength, not just in herself but of her powers, and I heartily cheered her on as she accepted her newfound role. Part of her role was dealing with this new guy. The angel from the book cover is named Elijah and he is the guy Sadie must believe in, especially if she is to survive. Besides dealing with his off-the-chart hotness factor, Sadie allows him into her life and into her heart. Elijah quickly became my favorite character (alongside Sadie). His strength in character as well as in battle, his reluctance to reveal too much too soon and hurt Sadie, his conflicting feelings for a human, his trepidation to seek her help in searching for a long, lost beloved brother, Elijah was the complete package. A man to admire. Honestly, I liked all of the characters, even Sadie's overbearing younger sister, Heather. The secondary cast of characters grew on me--Ben, Lyric, Holly, Astrid, Jen--and the author's mythology was unique, fully realized and keep me fully engrossed. I enjoyed the spin on old otherworldly creatures and the twists and turns the story took. What I really loved about Fierce Dawn was Amber Scott's writing. Her prose--her action scenes were written as compellingly as her descriptions, dialogue, and love scenes--making this story a joyride of action, adventure, romance, and wonderful storytelling. Some novels may grab me but I'm aware I'm reading a 'book'. With Fierce Dawn I lost track of time, happily and fully engulfed in the world of angels and seekers and mystifying powers. Gushing over a book isn't my usual manner of reviewing but I loved Fierce Dawn so much I emailed the author to compliment her. This was my first Amber Scott reading experience and it definitely will not be my last. She's a very talented author and one to watch for new titles. And now while I wait for my newest favorite vampire, Lyric's story to be told in the next book in the Realm series, I'll check out some of her other books. Fierce Dawn is a highly recommended read for paranormal fans. Favorite excerpt: "As you know, maintaining a good balance of your medications is crucial to your stability, your well-being and to your functionality. I know you want to remain functional, Sadie." Play along, anything to avoid sounding alarms. "Absolutely. I didn't think of it that way. I'll call him right after our appointment today." Dr. Meyers smiled. "Good. I also think we'd better see him as soon as possible." By we, Sadie knew Dr. Meyers meant she. Or did she? "Okay," Sadie said, unable to look at her sister or the painting. It needed so much more. His eyes, the black-winged man in the distance behind him. "I'll make an appointment." "I think you should take this with you," Heather retrieved the journal from beside her, hidden from view. "I think he should see him this, too." Heather pulled out another hidden bound book. Sadie recognized the flowery, homemade cover immediately. Memories of her mother, frantically scribbling into one of hundreds like it, flashed through her. Her mouth went dry. "Why?"" Cover comment: I'm not in the habit of getting all swoony and drooling but this cover makes me act (kind of, well, OK, A LOT) like that. The way the model's eyes are downcast, his pose, the open jacket, even the tease of wings catch and hold my eyes. I find it an ethereal cover. Book source: I had originally received a code from a Cage Match but due to illness went to redeem the code and it had expired. Already intrigued by the good comments and that killer cover, I purchased the ebook for my Kindle. I agree Laurie! Amber is AH-MA-ZING! I've had it BAD for Elijah and I'm drooling in anticipation for Lyric. Keep an eye out too! Amber will be featuring her books in the Labor Day .99 cent Blow Out and the Blog Tour de Force Masquerade event in October! That will be an awesome time for everyone to stock up on her books!! This does sound good and if you like it that much then I HAVE to check it out!